The places like Lumbini-Nepal, Bodh-GayaNorthern India, Sarnath, Varanasi-U.P. and KushinagarU.P. are the four noteworthy locations, where Gautama Buddha was born, gained enlightenment, preached his first sermons and at the age of 80 attained Nibbana. Indeed! These are the most sacred places in Nepal and India. From the ancient Rakhine historical point of view, grandfather of Gautama Buddha Einzana (from his maternal side ), altered the ancient Kokethamin Era 8645 to 2 and the out coming era was called Maha Era or Einzana Era. Rakhine King Ralamaru, 2411 in the line of Kanrazagri or Kamaraza, founder of second Dhanyawady, also favoured the alteration made by Einzana. In that era, Gautama Buddha was born in 68 Maha (572 B.C. ), renounced the world in 97 Maha (543 B.C. ), gained enlightenment in 103 Maha (537 B.C. ), and passed to Nibbana in 148 Maha (492 B.C.). We learned from an article entitled " Review of the most ancient Rakhine " written by a learned scholar of the most ancient Rakhine History, U Sein Nyo Tun, I.C.S. (Retd. ), that Candathuria the founder of 31 Dhanyawady, was also born in 72 Maha (563 B.C. ), ascended to the Rakhine throne in 97 Maha ( 543 B.C. ), and died in 149 Maha or New Religious Era (491 B.C. ), one year after the Gautama Buddha's Parinibbana. In other sense, Gautama Buddha and Candathuria were contemporary to each other. Moreover, we also learned that Gautama Buddha visited to Dhanyawady and preached King Candathuria in 123 Maha ( 517 B.C. ), after the 20`h monsoon retreat. At the same date, King Candathuria had cast a bronze image of Mahamuni (Christian dating system in use here is in accordance with the Vikram Sambat Calendar dates). As we all know that, for about forty-five years, Buddha and his disciples traveled from place to place (within Majjhima ), preaching to people of all works of life and the greatest Kings of the time favoured him and his disciples. Dr. Forchhammer a renowned archaeologist. wrote in his book entitled " ARAKAN " about a history of Mahamuni Shrine and the Sappadanapakarana, an ancient Rakhine manuscript of great value. According to this manuscript, Buddha with 500 disciples came to Dhanyawady by aerial journey. While sojourning in Dhanyawady, during Candathuria rule in 554 B.C. (revised 517 B.C. ). The Blessed One complied with the King's request for permission of casting an image of the Teacher. The King as well as his subjects offered " Nine-Kuti " worth of precious metal and in the presence of the Buddha, Mahamunithe exact likeness of the Buddha was cast. Most of the Arakanese chronicle sources unanimously state that Buddhism, which had existed during the reign of King Sanda Suriya, who dedicated the illustrious Maha Muni Image in B.C. 554, has become the prime faith the phenomenon now called Buddhism in Arakan which began its gentle progress to farthest reached of the globe. Ancient Arakanese legendary gives detail accounts of King Sanda Suriya who endowed the great shrine Maha Muni on the occasion of Lord Buddha landing to Arakan in 123 Bowdaw Inzana Era, 25 years before Buddha's Mahaparinibbana. The Buddha visited to Arakan expressly to enable King Sanda Suriya to build a life-size image of himself and Buddha blessed on alighted on the top of Thelagiri Hill situated the east of Kyawtaw on the bank of Kaladan. The Buddha had parted His Holiness teeth emitted rays of light that shone forth with a dazzling vividness in all directions, and to the reverend Ananda, his beloved cousin. He blessed the wishful remarks: "Danyawaddy is great and splendid country which shall have ninety-nine towns on its eastern bank of the Gacchapanadi and ninety-nine towns on its western bank. Its kings shall continue to be the ancient Kshatriya stock and particularly our Sakya race has been descended from Ajjuna Hermit-King of Kapilavastu. As a Bodhisattva, I was reborn many a times here; I shall have in this noble country; my own image built that shall enclose in this land for 5000 years during the life of my Sasana or Buddhism". Arakanese were justly claimed to be the first in Asia outside India to have heard the word of the Buddha that was too from his His Holiness lips. When the image was finished, it was established in Thiriguta Hill amidst universal rejoicing when gods and men could mingle freely to worship the great image of Maha Muni. How deeply intertwined the image of Maha Muni was in the heart of Arakanese might be gathered from the following classical passage in poem Arakanese Princess Egyin written by Badu Mong Nyo in 15th century. (Rakhine Princes E-Chun) (Stanza-9) Truly peculiar and noble indeed, That banner of king of king, Sadden elephant of snow-white variety Possessed while ruling Dynyawady, Golden Land, country complete with prosperity. The reign of Sanda Thuriya, generous monarch, Coincided with the life of the Buddha. Invited Him to Dynyawady with all his heart. Due to his request in earnest, Lord mercifully let him cast Maha Muni Image, now we have. Visukamma and Sikra Deva came to help. Alloy of five noble metals was used by them But they could not accomplished by then Only after the Buddha offered Seven Handfuls of His bodily warmth to the sculpture, Beloved Brother, His Holiness comes to life, As His representative exact, the image he left; Man, Deva and Brahma have a chance To worship Him in great respect. Great image was held in reverence. (Rahine Roma Magazine) Later Maha Muni, the great image of worship became symbols of an independent Arakan, has retained its deep spiritual vibration inspired countless beings to contemplate upon righteous way of life, higher principles to live for and noble ideas to aspire after, and the shrine itself has been the most focus of attention for millions of pilgrims throughout centuries. Its history supplemented by geographical, archaeological, and literacy sources of Arakan as well as travelers accounts had enlightened us, it is true. Information regarding early introduction of Buddhism in Arakan is from two sources; first from the archaeological discoveries and the second from the records of Arakanese literature. From archaeological evidence, we find a number of symbols that are of religious significance, special to Buddhism. Perhaps most importantly, there have been discovered several image stone figures. An ancient stone inscription in Nagari character was discovered by renowned Archaeologist Dr. Forchhammer. Known as Salagiri, this hill was where the great teacher came to Arakan some two thousand five hundred years ago. Somewhere from eastern part of this hill, a stone image in Dhamma-cakra-mudra now kept in Mrauk-U museum, was found earlier in 1923. This relief sculpture found on the Salagiri Hill represents Buddha preaching King Canda Suriya belongs to 4th century A.D.; five more red sandstone slabs with the carving were found close by the south of this Salagiri Hill in 1986. They are the same type as the single slab found earlier in 1923. These carving slabs of Bhumispara-mudra, Kararuna-mudra, Dhammacakra-mudara, and Mmahaparinibbana-mudra represent the life of Buddha. These sculptures provide earliest evident about the advent of Buddhism into Arakan; during the life time of the Buddha and these discoveries were therefore assumed as the figures of King Canda Suriya of Dyanawady, who dedicated the Great Maha Muni Image. These archaeological findings have been studied by eminent scholars and conclusion is that the Maha Muni was made during the king Sanda Suriya era. "By the help of Visukarma The divine creative genius It was wrought - The present Mahamuni, When it could not be done With the hollow of the hand The Master gave Exactly seven times The precious metals: With the warmth of His Boson And behold The likeness of The Master appeared To be revered by Brahma, Devas and men The Gift of the Purest Of all hearts." In time, the Mahamuni became renowned and pilgrims from far-off paid regular visits. This Mahamuni Image has been taken away from the soil of its origin and now enshrined at Mandalay still receives sacred allegiance from millions of South East Asian Buddhist devotees. Gautama Buddha visited Dhanyawady with the object of leaving his Sasana as well as his Image, for he foresaw that the Sasana would get lost in India after his passing to Nibbana. On arrival at Thaylagiri, Kyauktaw Hill, Gautama Buddha related to Ananda, the history of the Rakhine Kingdom, in order that he may know in what kind of a country. He was leaving his Sasana as well as his Image. Some are of the opinion that Majjhima ends at the Rakhine Yomas. Since, after sojourning in Dhanyawady, Gautama Buddha proceeded as far as Tan-Gyi-Taung, the East Bank of the Irrawady ( Ayeyawady ) River, and from where predicted that the Tharay-khattara Kingdom will be formed in the opposite Bank in the future. We have to assume that Majjhima ends in the West Bank of the Irrawady ( Ayeyawady ) River. 1. 1. Antony Spaetu - A question of faith Time may 26, 1997 PP.42-48. 2. Banerji, R.D. -A Junior History of India. (Blackic & Son India) Ltd 3. Forchhammer, Dr. - "Arakan", Mahamuni Shrine and the Sappadanapaka-rana Manuscript. 4. Mayda Pinna - 81h Century Mayda Pinna Verse. 5. Sein Nyo Tun, U.I.C.S.Retd. - Review of the most ancient Rakhine History & History of Rakhine as foretold by Gautama Buddha. May 1966. 6. Shwe Zan, U - The Golden Mrauk-U, an ancient capital of Rakhine, PP. 154-155. 7. Than Tun, Dr.M.A., BL., Ph.D.- An Old History of Burma, 1969. Two thousand five hundred years have passed since the time of Parinivana of Gautama Buddha. Throughout the centuries, ever since the introducing of Buddhism up to the present time, Arakan professed Buddhism without break. The Buddhists here worship caityas and stupas. They believe that one can acquire great merit by building and decorating them. The Buddha images are also worshipped after glorifying by conducting a ceremony called Anekasa, that is recitation by a number of monks surrounding the image. The people worship these caityas, stupas and Buddha images by offering flowers, food, incense, light and prayers. They believe these acts to be meritorious. They believe in the idea of the transfer of merit. That is, by making gift one can acquire religious merits and one can also transfer such merits to one's near and dear ones or their welfare and happiness by performing meritorious deeds like offering alms and the four necessaries to the Sanghas and giving charities to the poor and the needy, and doing good deeds personally or in words or in thoughts, one gains merit and will go to devas abode after death. Where as by doing evil deeds or getting involved in evil acts personally or in words or in thoughts, one falls into downward state of existence, a state of suffering or even to the abyss of hell such as Aauruwa, Avici etc, ...after death. They believe in the three ways to salvation, i.e., the Arahatship, the Pratyakabuddhahood and the supreme Buddhahood. The lay people strive for Arahatship as the way to Nirvana. They accept the idea that the universe is cyclic and that they live in a Buddha cycle called Bhadrakaipa and are expecting the coming of the fifth Buddha, Maitreya. There are many members of the Buddhist Order, that is, the monks (Sangha) who wear yellow robes and strictly observe the Vinaya Pitaka. They have given up all the wordly pleasures and lived a pure life striving to attain Nirvana. The lay people have noviciating ceremonies for boys who spend sometimes, usually a week or more in a monastery under the guidance of revered abbot to experience the life of the monkhood. During his stay in the monastery as a monk, the boy learns for himself the religion of his parents, the abbot guiding him of course. If he likes the life of a monk and wants to forego the worldly pleasures, he can become a monk for life. But he will be qualified for full membership of the Order only after attaining the age of twenty. If not this ceremony can be taken as a preparation for adult life. In Arakan, noviciating of a boy is done only when the boy reaches an age when he can understand and assimilate Buddha's teaching. Especially during the period of Wasoe (Buddhist lent which falls during rainy season), people are accustomed to keep sabbath taking five, eight, nine or ten precepts. People in more advance stage of piousness mediate to free themselves from ten "fetters", i.e. Samyojana. Such are the beliefs and practices of present day Buddhists of Arakan. The same is true for the past centuries. There are numerous caityas (pagodas), stupa and innumerable Buddha images built and made by the king of these dynasties. 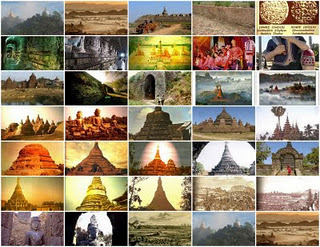 Especially Mrauk-U, the last capital city of Arakan, is rich in these religious edifices and images. Miniature stupas, miniature caityas, bronze bells, bronze lamps and many types of bronze Buddha images, crowned and uncrowned were obtained from the relic chambers of the old ruined caityas and stupas. They belong to the period of Danyawaddy and Vesali. When did Buddhism first introduced into Arakan? And what type of Buddhism was that? According to tradition and our historical annals, Buddhism was introduced into Arakan during the lifetime of Buddha himself. Keeping tradition part, let us search for concrete evidences which will give of Buddhism introduced. We have found one Fat Monk image with a line of inscription in Brahmi script used about the beginning of the Christian era. This Fat Monk, Saccakaparibajaka, was related to an incident in Buddha's life. Images of Buddha were also found together with this image. As there were no inscriptions or dates inscribed on them, it is difficult to assign them to the same period as the Fat Monk. Apart from this image we can search for more concrete evidences. We may take the miniature stone stupas with Ye Dharma verses on them, the stones with Ye Dharma verses fallen out of the ruined stupas or caityas, and inscription found on one of the Mahamuni sculptures as the solid evidence for dating the upper limit of the introduction of Buddhism in Arakan. The dating can be done palaeographically and these writing can be assigned to some time about the 4th or the 5th century AD. As almost everybody knows, "Yedhama gahta" is the most popular inscription among the earliest records of Buddhism in Myanmar. In Rakhine the earliest" Yedhama gahta" was suggested to have issued in the fourth century A.D. This piece of work is an attempt to trace the Buddhism, in Rakhine, of the period before Yedhama. The local chronicles traditionally say that during the reign of King Candrasuria in the Danyawaddy city Gotama Buddha, while visiting, converted the court and cast the image, Mahamyatmuni. According to this tradition Buddhism is supposed to be introduced to Rakhine since Buddha's lifetime in the sixth century B.C. It was also in the Danyawaddy dynasty that Reverend Htayra Maha Yewata was said to have come to Mahinsaka manahala for conversation, after the third Samghayana was held at Pataliputta. Some consider that the present Rakhine was once part of Mahinsaka. However some scholars insist that Mahinsaka was at one time the same of Mysore at the southern part of India. Above traditions hint that Buddhism came to Rakhine in the 6th century B.C, or 3rd century B.C respectively by means of missionary activities. However, may be unfortunately, no contemporary record is found relating to these traditions. The crowing event in the history of Arakan was the Convention of the Buddhist Council at the top of golden hill of Vesali under the royal patronage of King Dhammawizaya in 638 AD. through joint effort of two countries, Arakan and Ceylon. This momentous triumph of the great council was participated by one thousand monks from Ceylon and one thousand monks from Arakan kingdom. As a fitting celebration of the occasion, the lavish construction of pagodas, statues and monasteries were undertaken for the purpose of inscribing the Tripitaka. After Vesali, Pyinsa was found by Lemro dynasty in 818 A.D; Pyinsa City (818 - 1103), Parein City (1103 - 1160), Nareinsara Taungoo (1160 - 1250) and Laungret (1250 - 1430) the great king of dynasty was King Mim-Yin-Phru, who turned his attention towards the development of Buddhism, and in 847 A.D. he conveyed the second Buddhist council in Arakan attended by 800 Arahants. Arakanese chronicles report that therein the Tripitaka and Atthakatha were incribed on the golden plate and enshrined. Never has there been impediment in the practice of Theravada Buddhist faith since it has introduced in Arakan. The copious findings of inscription Ye Dhamma verse (gahta) were practical evidence that Theravada was dominant faith if epigraphic and archaeological sources were to be believed. The Royal patronage has always been significant factor contribution to stability and progress of the religion in Arakan. Dr. Niharranjan Ray had attempted to identify the Cilata (Kirata) country with the regions of Rakhine and lower Burma (Myanmar). Besides there is a strong tradition that Kirata was a province of Burma as indicated by a bell inscription, though modern (viz.1811 A.D) at the Mahamuni pagoda, Mandalay (Middle area of Myanmar). As Nagarjunikonda inscription was issued in the 3rd century A.D. The sending of the Buddhist mission must be some time before the 3rd century. If so it would not be far too wrong to conclude that Buddhism had already arrived at Rakhine in the 3rd century A.D. At this point the popular tradition, which says Buddhism came to Rakhine at the reign of King Candrasuria should be considered in the context of Phayre's suggestion of Candrasuria period in the 2nd century A.D.
Ray also suggest, even apart from the tradition of Asoka mission, it is not impossible to assert the prevalence of Buddhism in Burma sometime before the 3rd century A.D. However no indigenous evidence relating to this period is found in Rakhine. Only for the lack of such evidence, we should not consider that Buddhism did not come to Rakhine. Regarding this George Coedes's remark is worthy of note. "Because of their geographical position it would seem that they ought to have been penetrated by Indian culture earlier and more profoundly than Funan, Champa, and the other kingdoms of father India, they offer, however, only rare and quite late archaeological and epigraphical remains for the period before the middle of the sixth century. It would be imprudent to conclude from this negative argument that they were Indianized later, for various circumstances may have caused the disappearance or delayed the discovery of order remains.The almost total silence of Chinese sources for the period in question is due to the fact that the envoy from China to the kingdoms of the south at that time used the sea route and countries situated farthest from China for seamen were the last to establish with her." Johnstone suggested the regional duration of king Candrodaya of Anandacandra inscription as 202-229 A.D and was inclined to equate him with Candrasuria of the chronicles. In this Anandacandra inscription the modification for the kings previous to Candrodaya are read ' zealous in doing kindness to the world', 'The able', 'eminent for stoutness',' fair of form' and 'heroic in policy'. Canrodayan and successor were, however, modified as 'approved by the good', ' giving of countless gifts',' want to heaven', and 'eminent in religious practices'. In contrast with the former one the later ones sound a bit religious. This fact also seems to provide us the liability to assume that at the reign of Candrodaya, in the third century A.D., a particular kind of religion had already been introduced in Rakhine. The Ye Dharma verse reveals the cream of the teaching of the Buddha. It is very clear that the people who made these stupas and who inscribed the Ye Dharma verses for the posterity professed the type of Buddhism based on the teaching of the Buddha and not on the personality of the Buddha. Again, the word mahasramana in the verse means the Great Monk. By using this word, it is clear that the Buddha was referred to as a Great Monk and not as a God. We have seen a ceti dedicatory inscription from eighth century Vesali. The inscription mentioned one to purify his own mind to attain Nirvana. The three impurities, lobba, dossa and moha should be discarded revealing that the Buddhism practiced at that time was based on the teachings of Buddha. Therefore, we can definitely say that the Buddhism that flourished during this period was neither Tantric Buddhism nor the advanced Mahayana with plenty of Gods and Goddesses. We can infer that the Tantric Buddhism, which is an advanced state of Mahayana Buddhism, never flourished in Arakan.